Stay at the Hampton Inn - Suites Pittsburgh/Waterfront-West Homestead and you*ll find yourself in the town of West Homestead within minutes of the dining shopping and entertainment just 7 miles from downtown Pittsburgh. Have fun at the Waterfront Dining and Shopping complex right across from the hotel. Don*t miss out on the area*s fascinating history explore the many historical pieces that are spread out over the Waterfront Complex. It*s all within easy reach of the Hampton Inn - Suites Pittsburgh/West Homestead. 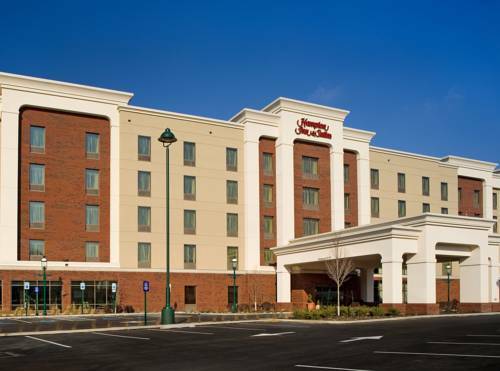 Once you*ve arrived at our hotel in West Homestead PA you*ll enjoy our range of great amenities and our friendly service. Take advantage of free high-speed internet access in your guest room and join us each morning for Hampton*s free hot breakfast. Get down to work at the business center with useful services and equipment including complimentary printing. Hold your important meeting or event for up to 50 guests in our Meeting Rooms. With a fitness center and indoor pool it*s easy to maintain your exercise regime while you*re on the road. Drop by the lobby for complimentary tea or coffee at any time there*s always a friendly team member on hand if you would like some advice on what to see and do while you*re in town. All reservations must be guaranteed with a major credit card or advance cash deposit to hotel regardless of time of arrival. All reservations must be cancelled 24 hours prior to host time unless deposit is required. Policy is subject to change. All reservations must be cancelled 24 hours prior tohost time unless deposit is required. If this reservation has been made electronically please cancel it electronically to avoid confusion and a no show bill. Policy is subject to change. The hall of fame displays full-size replicas of famous Hollywood robots, but it's the industrial robots that'll have you trembling as they outperform humans. Step aside, life form! A towering fiberglass man outfitted as a Pittsburgh Steeler football player. Missing his head of late. A metal statue of a hooded man pays tribute to Ohio Valley steelworkers.